New research provides revelations about the most energetic event in the universe — the merging of two spinning, orbiting black holes into a much larger black hole. An international team of astronomers, including from the University of Cambridge, have found solutions to decades-old equations describing what happens as two spinning black holes in a binary system orbit each other and spiral in toward a collision. The results, published in the journal Physical Review Letters, should significantly impact not only the study of black holes, but also the search for elusive gravitational waves – a type of radiation predicted by Einstein’s theory of general relativity – in the cosmos. Unlike planets, whose average distance from the sun does not change over time, general relativity predicts that two black holes orbiting around each other will move closer together as the system emits gravitational waves. The energy lost to gravitational waves causes the black holes to spiral closer and closer together until they merge, which is the most energetic event in the universe, after the big bang. That energy, rather than going out as visible light, which is easy to see, goes out as gravitational waves, which are much more difficult to detect. While Einstein’s theories predict the existence of gravitational waves, they have not been directly detected. But the ability to ‘see’ gravitational waves would open up a new window to view and study the universe. Optical telescopes can capture photos of visible objects, such as stars and planets, and radio and infrared telescopes can reveal additional information about invisible energetic events. Gravitational waves would provide a qualitatively new medium through which to examine astrophysical phenomena. Later this year, upgrades to the Laser Interferometer Gravitational-Wave Observatory (LIGO) in the US and VIRGO in Europe will be completed, and the first direct measurements of gravitational waves may be just around the corner. Around the same time, the LISA Pathfinder mission will be launched as a test mission for establishing a gravitational wave detector of unprecedented sensitivity in space. The equations the researchers solved deal specifically with the spin angular momentum of binary black holes and a phenomenon called precession. Just as Kepler studied the motion of the earth around the sun and found that orbits can be ellipses, parabola or hyperbolae, the researchers found that black hole binaries can be divided into three distinct phases according to their rotation properties. 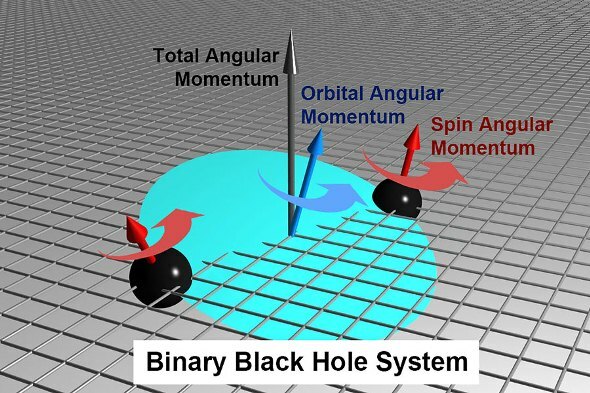 The researchers also derived equations that will allow statistical tracking of such spin phases, from black hole formation to merger, far more efficiently and quickly than was possible before. Researchers from the Rochester Institute of Technology and the University of Mississippi also contributed to the Physical Review Letters paper. The researchers were supported in part by the Science and Technology Facilities Council, the European Commission, the National Science Foundation, UT Dallas and the University of Cambridge. Adapted from University of Texas at Dallas press release.